Henry I. Bussey, Pharm.D. with input from Sarah Spinler, Pharm.D., and Melissa Smith. 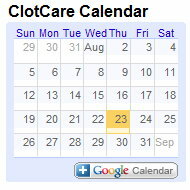 SafetyAlertsforHumanMedicalProducts/ucm190848.htm) and the change in the clopidogrel (Plavix) package insert (see products.sanofi-aventis.us/PLAVIX/PLAVIX.html) advising clinicians to avoid the use of Clopidogrel and omeprazole (Prilosec), and perhaps several other agents. The reason for the warning is that these agents are known to inhibit the CYP 2C19 hepatic enzyme that is responsible for converting clopidogrel to its active metabolite. Reduced conversion of clopidogrel to its active metabolite can reduce the therapeutic effect of clopidogrel and increase the risk of cardiovascular events. 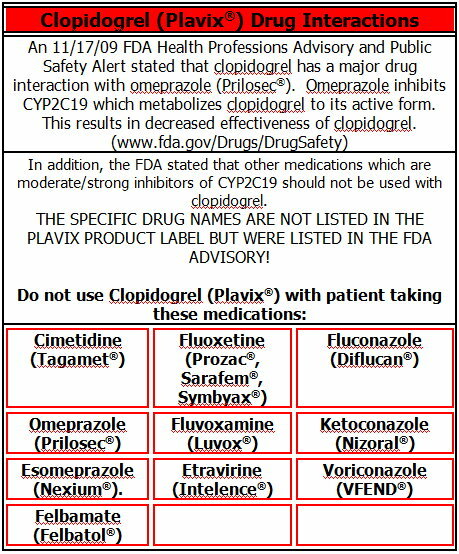 Even though reports have questioned the clinical impact of this interaction with various medications and in various patient groups, the FDA advisory and the change in the package insert would appear to carry legal status that clinicians should consider when using clopidogrel.